Description: The epidermis is translucent white. As in F. auriculata, there is a rose coloured hue around the mouth. The red oesophagus, situated just behind the rhinophores, is clearly visible. There are a few patches of white pigment on the head, between the rhinophores and down the tail of the animal. Sometimes blue iridescence is present in small areas around the head. The rhinophores are annulate, the oral tentacles are very long, both sets of tentacles are tipped with white pigment. Brown digestive gland is visible through the cerata epidermis. Large individuals may grow to approximately 55mm. 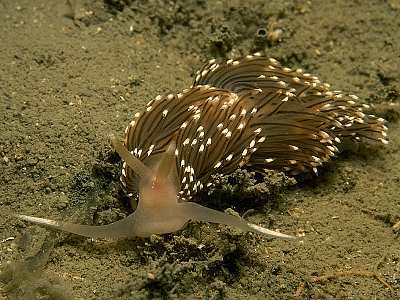 Habitat: Subtidally this animal may be found on Tubularia larynx, however it is often found on the low shore on Clava multicornis. Distribution: Known from the north east coast of America and from Norway to the Mediterranean. Similar Species: Similar in appearance to Facelina auriculata, but F. bostoniensis has a much broader body and usually there is only a small amount of blue iridescence. Foot broad and cerata long, overlapping, extending beyond tail. Cerata with streaks of white pigment but without blue iridescence. Picton, B.E. & Morrow, C.C. (2016). Facelina bostoniensis (Couthouy, 1838). [In] Encyclopedia of Marine Life of Britain and Ireland.